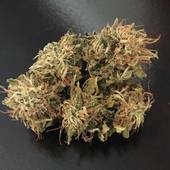 Northern Lights is renowned for its ability to be grown very easily. The strain's reputation also comes from the fact that it has won competitions such as the Cannabis Cup. The #5 strain was first entered into competition 1989 when several seeds were mailed from the U.S.A. to Amsterdam. The strain quickly dominated the Cannabis Cup, winning in 1989, 1998, and again in 2009. It is a cross of Cannabis indica and Cannabis sativa. Great head crush, pain slides to the side and a good night sleep comes next. Having R.A., Northern Lights is a great strain to ease the pain. Thank you Northern Lights Provisional for your assistance in this wonderful medication. It hase a good taste and aroma. Northern Lights was one of those strains I was always looking for in my younger years, it just happend to evade me. Once I stumbled upon this great herb my early memories came rushing back to me. This stuff is better than I expected, taste and smoke. It's smooth with hints of pine needles. Almost spicy. Quite the head smasher.